The Mexican indie rock band Enjambre combines classic rock with the vintage sounds of Mexican romantic music from the ’70s. The band’s members hail from the Zacatecas, Mexico, but formed the group in Anaheim. 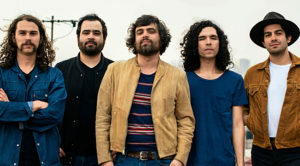 After recording an EP and their first album, the guys decided to move back to Mexico, where they caught the attention of EMI Capitol, which signed them. Produced by Phil Vinall, their new album, Imperfecto Extraño, features string arrangements and vintage synthesizers and achieves a cinematic feel. Guitarist Javier Mejia spoke to us via phone after the band had hosted a private showcase at the Gibson Guitars showroom in Beverly Hills. What was the showcase like? We did that at the Gibson showroom in Beverly Hills. It was fun. There were a lot of people there from the L.A. circuit. We were like little kids in the toy store with all the Gibson guitars. The band first formed in Anaheim. How exactly did the group come together? It’s three brothers and two friends. There are five of us. Two of us were looking for other band members at the same time that the other guys were so we fit perfectly together. That was 2006 or 2007. We did a few demos. We were doing the whole Southern California circuit. We thought we could find a bigger audience in Mexico City. We did some tours out there and did that for a year and half after we recorded our first album in Southern California. It’s been around nine years, so we just never went back. Did you fit into the Orange County scene? It was difficult since the music was Spanish. There were a few bands doing that but we got to the point where we didn’t notice any more progress or growth. It was get out or get stuck where we were. Did you listen to lots of Latin rock? At the time, there were great things happening in Latin rock. We’re big fans of Café Tacuba and things like that. But we grew up on classic rock ’n’ roll like the Beatles and Zeppelin mixed with your romantic ballads from the ‘60s and ‘70s. That’s what influenced us the most . . . having that around as kids and mixing that with our influences as teenagers. Did you record your first EP and album in the States? We did both of those and they were homemade. We recorded anywhere we got a chance. We did some in Big Bear [California] and some guitars and drums in the desert by Indio where they have Coachella. We had this old warehouse that a friend let us borrow and we would just practice and record there. That was a lot of fun. It was very homemade. We made 1,000 copies and just gave them out all over Mexico. How’d you wind up with a deal on Capitol? We started making a lot of noise in Mexico City and started playing a lot of venues. We got their attention after we played Viva Latino, one of the biggest if not the biggest Latin American music festivals. We noticed that a lot of people showed up for our set. Radio people and journalists wanted to know what we was up with up. They did a license for what was going to be our second album. We were happy with their mentality and how they wanted to work with us. We’ve been with them ever since. We’re up to our sixth record now. You worked with Phil Vinall on your new album. How’d you meet him? He’s a character. He’s a crazy Englishman. We met him in Mexico City through friends of ours. He worked with Zoe and produced their records. Before he worked as a producer, he worked as a sound engineer who did front of house. He worked big venues out there. We were happy with the result. We had produced our records ourselves up to then. We wanted someone outside the circle of us five guys. He did the last one and the new one that just came out. We had a blast with Phil. He has his studio in Mexico. He’s a great, great guy. He just started working with bands based in Mexico and I’m assuming he really likes the place since he’s been in Mexico City for quite some time now. The album’s opening track, “Obertura,” has a real cinematic vibe to it. Talk about it. [Singer] Luis [Humberto Navejas] pictured it like you were watching a movie when you were listening to the record. He wanted something dramatic as the introduction. He had this melody and beat in his head. There are guitars overlapping and strings. [Then] when you get to the halfway point, there’s this song which is also instrumental. It’s like the middle of the movie. The intro and the middle and the last track are all connected like the beginning and middle and end of a movie. “Detéstame” features some dense instrumentation. What instruments do you use on that song? We used a bunch of synths and strings and guitars. There’s a lot going on. Is this the most complex record you’ve made? We did things different this time. Julián [Navejas], the other guitar player, originally wanted to make an album with two guitars and less synths. It ended up the opposite. For the first time ever, Julián plays no guitar on the record. It’s just me and Luis. We added acoustic stuff. Julián has collected these old vintage synths from the ‘70s and ‘80s. We liked everything he brought to the studio and had him keep adding things. It just ended up staying. We were lucky enough to run into a quartet of strings at Sonic Ranch when we were recording. On the track “Vida En El Espejo,” you can hear all the string arrangements there. Stuff like that we did for the first time. We played acoustic on some songs. I ended up with the electric guitar work and Julián did the keys. Do you have to rearrange the songs when you play them live? It just came out so we’ve thrown some strings in there for the live shows. We don’t have a rule but we like to record things that we can do live. We do everything we can to sound identical to the record. At the same time, Julián has to recreate all these sounds because it’s so hard to carry those old huge synthesizers on tour. Is the music scene thriving in Mexico City? There was a point when we got there years ago that there was a big new wave of fresh bands. Now there are bands doing cool stuff. It’s cool to see that each of these bands has their own sound. It’s not just a movement that everyone is following. Everyone is doing their own thing and because of that there are cool festivals that weren’t happening years ago. That’s good for a lot of bands to promote their music and it’s good to expose your music to a large number of people. That’s what’s happening now. It’s a monster of a city and you’ll never see every corner of it. We’ve been there for years and we still run into a new street now and then. Would you ever make an album with English lyrics? I don’t know. There’re a few songs out there that Julián has sung in English with other bands. There’s one we did called “Reddish Sky” and another one called “Makin’ it Back,” which is also in English. It’s there. If it comes to us naturally, we don’t have a problem with putting it out. It’s whatever feels best.